I have been sick on a constant basis since my son was diagnosed with Autism (my first symptoms started exactly 6 weeks before his diagnosis) in 2008. I attributed it to stress and did my best to RELAX. Unfortunately, no matter what I tried, I continued to be sick. I had my gall bladder removed, had 2 biopsies, was diagnosed and treated for ulcers, constipation, pleurisy, migraines, and a whole lot more. My symptoms were many, and finally during the summer of 2011, I was reading a book that mentioned Celiac Disease and I decided to research it more. Wow, what a revelation to read over the symptoms and to realize that I had EVERY SINGLE SYMPTOM, with the exception of only one. I was tested and was unable to get a confirmation of Celiac, but the doctors were not able to rule it out, either. What I do know is that I started living gluten free and my life has dramatically changed. The only problem? 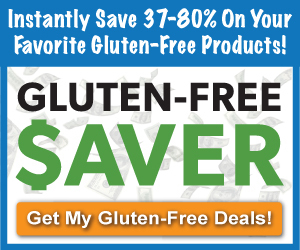 Gluten free foods can be so expensive! I have had to get a job and give up being a stay at home mom simply to cover the costs of this new way of life, and to pay for therapies for my son. I’m SO excited for this website! I really feel it’s going to make all the difference in the world!!! Thank you! Thank you for sharing your story with us. Do any of you have tips for success for living with Celiac Disease? I was diagnosed with celiac disease and divertiulois just 2 days ago . My Dr said my grocery bill will definitely go up .I can’t afford to put out more money . I need help.